What is a DA Form 2062? DA Form 2062, Hand Receipt/Annex Number is a form issued by the Department of the Army (DA) and used for tracking Army property. A fillable January 1982 version of the form can be downloaded below. A hand receipt must be supplied to all U.S. Army unit commanders having any Army property in possession. The commander then appoints primary hand receipt holders, which will ensure that all Army property is properly recorded and listed on the DA Form 2062 prior to signing it. as a hand receipt/components receipt with Accounting Requirements Code (ARC). How Long Is A Da Form 2062 Good For? HAND RECEIPT ANNEX/COMPONENTS RECEIPT, enter Accounting Requirements Code (ARC). There are several ways to fill out the DA 2062 Form depending on its intended use. The first two boxes require the information about the individual or unit supplying the property and to whom the property is transferred. 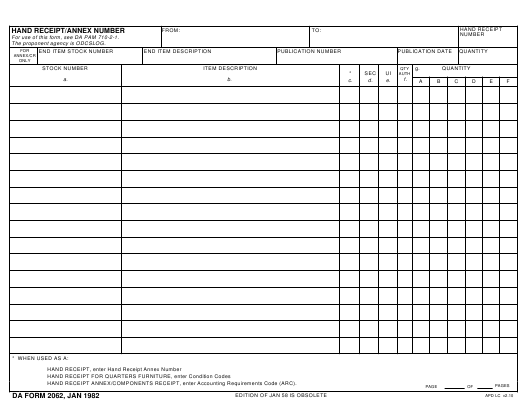 Fill in the third box on the top of the page with the serial number of the current form. The second line of the form - the annexer - is for listing the end item's stock number and description, its publication number, date and quantity. Fill in the Stock Number column with the stock numbers of all items described in the form. In case if an item has no number, it should be requisitioned by Federal Supply Code for Manufacturers. Part numbers are requisitioned from the U.S. Army. The Item Description Column identifies the item contained in the COEI (Components Of End Item), BII (Basic Issue Item), and the AAL (additional authorization list) listings. All these descriptions can be found in the items Technical manuals. This column may also contain additional data that will aid in identifying the item. Column C depends on the further use of form DA 2062. It contains the Hand Receipt Annex Number, Condition Codes (if the form is used for quarters furniture) or Accounting Requirements Code (ARC) for a components receipt. The rest of the DA Form 2062 is divided into a grid with one line for each item with space for the quantity of the items being transferred left at the end of each line. Thorough and complete instructions on how to fill out the DA Form 2062 can be found in the Army-issued Pamphlet DA PAM 710-2-1. A DA 2062 is considered to be good for 6 months. Use a DA Form 3161 in case you need to issue a piece of equipment for a longer period of time. The key thing to keep in mind is that the DA Form 2062 is a temporary hand receipt and is not supposed to be a permanent record of property.